Breg's Ultra Aurora ankle brace combines a hybrid design for comfort with a rigid footplate for ankle stability. The Breg Ultra Aurora Ankle Brace is a hybrid between the Ultra Zoom and High-5 braces. The new Ultra Aurora combines the comfort of the Peformathane ankle cuff with the stability and control of a rigid hinged footplate. The unique material automolds to ankle for a more custom feel. Provides prophylactic sports protection for support for chronic injuries and ankle instability. Low profile Peformathane soft shell. Forms to ankle for more custom feel. Universal - Fits left or right. 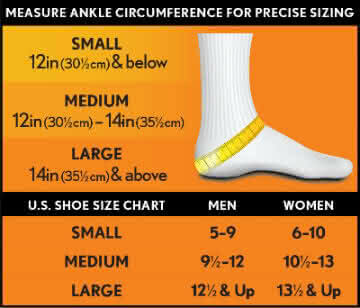 Three sizes - See sizing chart for measurement/fit help. The Breg Ultra Aurora Ankle Brace may be used for sub-acute ankle sprains, chronic ankle instability, and sports prophylactic ankle support/protection. Performathane plastic material; Foam liner. Excellent product for preventitive use Review by John T.
I have tried many different types of ankle support for volleyball and this is by far the best for good ankle support to help prevent ankle sprains. It is much stronger than all the popular types sold by volleyball stores but also much more comfortable than some of the heavy-duty versions that have hard plastic that causes pressure points on your ankle, shins or instep. They are more expensive than the more common types but well worth it. This is my second set for my son. Better than my old McDavid Review by Tina J. This brace is better than my old Mcdavid that had a similar design. I sprained my ankle twice now while playing outdoor soccer. I got this Aurora brace to protect my ankle from rolling over. The shell is very supportive and the liner is comfortable.